Well, not so much a mission as a long-established church that has been around for centuries… but I like that song, so. 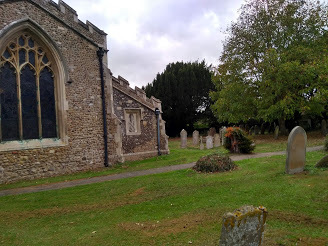 I was down in the churchyard, because the school does most of their harvest celebrations down there. It was your standard, mainly benign school show, though I did turn my nose up at one of the older classes’ presentation being very moralising in ways that are just… not, like ‘Don’t waste food ’cause Africa (‘and those other places’ — their words, not mine). Yes, it is a genuine tragedy that there are people all over the world starving, but could we not address it in a way that strongly suggests that people of colour only get by at our sufferance? I get that Britain used to be the whole empire thing, but still. *still* I also don’t want my children feeling like they have to eat when they are not hungry, which teaches them to not listen to their own bodies. I’d rather they left half the plate empty — and that’s coming from someone who grew up in a food insecure environment. Anyways. I’mma go back to creating a Sim, and mulling on earring design.